“True technology integration is seamless, it shouldn't be viewed as an add-on, an afterthought, or an event." P. Brown. One of the most simple ways to begin to breakdown your classroom walls is to build a strong PLN, or Personal Learning Network. A personal learning network is made up of people/places you go to gain knowledge, share knowledge and collaborate with others of like minds and interests. After all, why reinvent the wheel? If you find someone who has great ideas that they are sharing through their blog, why not try them out? 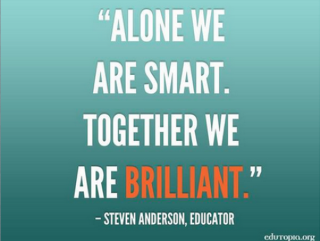 Twitter is one the easiest and common ways to develop a strong PLN. Following people who share your role in education, or what you aspire to be, is key to staying connected and current with tech trends. When corporations want to get the word out on their new products, they usually take to Twitter and other social media outlets first. Check out your local edtech organizations that host weekly chats on twitter like #moedchat in Missouri, or hashtags #edtech, #digitalmedia, and #mobilelearning. Still looking for ideas of tried and true ways other educators are using technology in the classroom? Try searching on Pinterest. There are so many edtech pinterest boards, where people post apps and blogs to try out, as well as ideas for using and iPads, and other technologies. If you are a visual person, pinterest is perfect for you. Teachers Pay Teachers- If only I would have thought of this! Teachers are taking what they have created for their classroom and sharing it with others. Some items for free, some are at a low -cost. Let's just face it, a lot of us don't have the time to spend hours developing lessons and projects for our students, due to various reasons, but having access to thousands of projects and lessons at your finger tips delivers a powerful one-two punch. Save time by browsing through resources other teachers have perfected, and use them to provide meaningful learning experiences for your students. Digital Media is changing how people, including our students, interact with the world. This paves the way for changes in the strategies and tools we use for teaching and learning. Becoming a digital expert doesn’t happen overnight: It takes some specific goal setting, and dedication. Focusing on one tool, or a few tools at a time is key to making sure you don't find yourself overwhelmed. Collaborating with others is a perfect way to strengthen your tech knowledge while connecting with your students and parents, both inside and outside of the classroom.